The Cape Anguille Light Keeper's Residence was constructed 1907-1908 as a double dwelling to house the light keeper and the engineer who operated the fog alarm machinery at Cape Anguille. The station itself was started in 1905, when the Lighthouse Board of Canada authorized the establishment of a complete new light station on the site. Land was acquired from Mr. James Samms and construction began in 1907 on both the fog alarm building and the double dwelling itself. The light tower was constructed in 1908-1909, and both the tower and fog alarm building were replaced in 1960. The structure is considered to have heritage value because of its unique design among light keeper residences. The double dwelling is an attractive, storey and a half, rectangular wood frame building with its main facade on the long side. Entrance halls at the outside ends of the porch lead into the houses. There are two enclosed porches at the rear, and pedimented dormer windows project through the roof on the front and back elevations. The house faces west towards the Gulf of St. Lawrence. Original plans for the building do not seem to have survived. Other double dwellings produced by the Department of Marine and Fisheries around the time seem to have higher upper storeys with gabled or truncated hipped roofs. While the double dwelling at Cape Anguille bears some stylistic resemblances to other departmental dwellings, this particular design may be one of a kind. The original layout of the dwelling was intended to provide comfortable living accommodation fro the keeper and his family. Downstairs a kitchen and a pantry ran along the outside walls on the north and south sides of the building. The living and dining rooms were beside the centre dividing wall. A stairway from the living room went up along the centre wall to three bedrooms upstairs. Alfred Patry was appointed light keeper in October of 1908 and moved into one half of the double dwelling. According to his son Laurier, relationships deteriorated very rapidly between Patry and the engineer who occupied the other half, and the engineer moved to nearby Codroy. Patry opened up doors between the two halves of the building, and his family occupied the entire building from then on. A few changes were made to adapt the house for use by a single family. The arrangement of the balustrade and porch supports were altered to provide for one central set of steps instead of two. Inside, the kitchen and dining room on the north side were combined into one larger room. In 1968, Laurier Patry and his family moved out of the building into a new dwelling, the residence was left unoccupied. In 1988, the Canadian Coast Guard decided to demolish the residence, but following a historic evaluation, the building was allowed to stand empty for several years. 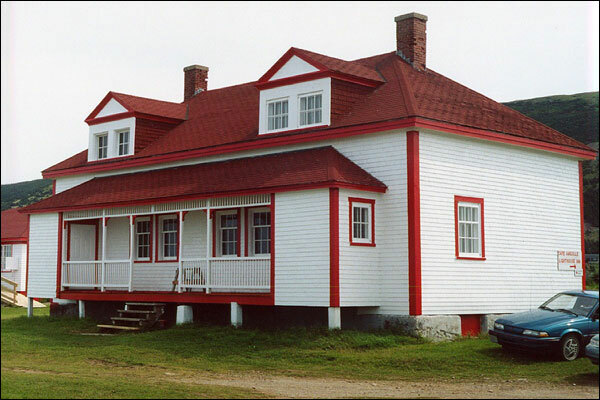 The Cape Anguille Light Keeper's Residence was designated as a Registered Heritage Structure by the Heritage Foundation of Newfoundland and Labrador on October 2nd, 2003. Currently, the building is being restored by Linkum Tours to be used as a tourist accommodations. Note: Much of the historical information presented here is taken from the Federal Heritage Buildings Review Office Building report 88-36, prepared by Margaret Coleman, Architectural History Branch. Also view the Cape Anguille Lightkeeper's Residence Registered Heritage Structure on the Heritage Foundation of Newfoundland and Labrador web site. The Newfoundland and Labrador Heritage Web Site has on its site only a portion of the registered heritage structures in Newfoundland and Labrador. To view a complete list or search for a particular structure visit the Heritage Foundation's Property Search page.